A couple weeks later I was dying to know if I would be asked to the Junior Prom--and less importantly who would ask me. 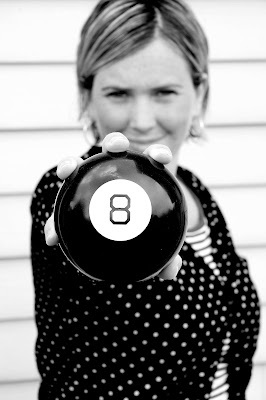 My best friend Wendy referred to my Magic 8 Ball which told me "Yes!" That very night, in the shadows of my red-painted-concrete front porch did roses appear with an invitation on a cute little card. That is when I gained a testimony of my Magic 8 Ball. After my garland was finished and hung in the kitchen, I went into my closet and recovered my Magic 8 Ball of old. I think you might know what question I asked it. My answer read, "Concentrate Harder and Ask Again Later." So I added that to my TO DO list. Emily's What Would You Do?